I confess I hadn’t heard of this movie, nor would I have likely given it a chance had it not been nominated for an Oscar this year. It’s been nominated for Best Original Song for “Grateful” (music and lyrics by the estimable Diane Warren, who has 7 other deserved nominations under her belt). It’s not always a delight sitting through a whole movie just to hear a song, and for judging purposes, it’s not usually even necessary since tonnes of the songs only appear over the credits and thus don’t have the benefit of a lot of context. But for once, I’m not even feeling resentful. The movie opens as Minnie Driver brings her little daughter Noni into a hair salon, hoping the woman can help her do her (black) daughter’s hair before a big talent show. The little girl sings beautifully but mother is furious when she only takes second place. Cut to: present day. 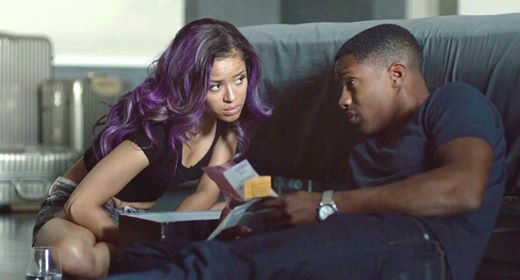 Noni (Gugu Mbatha-Raw) is on the verge of pop star success with a purple weave and a crotch-grabbing music video. But everything she’s always wanted is not quite what it’s cracked up to be. Why else does she feel like throwing herself off her glamorous hotel balcony? Along comes knight in shining armour (also known as celebrity bodyguard) Kaz (Nate Parker) with a dose of reality and some ambitions of his own. Is this supposed to be The Bodyguard of 2015? Or just a guard with a damn fine body? It’s not exactly an original story. I bet you can guess right now how it goes! But that didn’t make it unwatchable. I mean, Nate Parker taking his shift off makes it watchable. Gina Prince-Bythewood, the writer-director (Love and Basketball), has all the elements of a classic backstage story, but is just shy of having it feel genuine. Minnie Driver, who easily could have turned out to be a one-dimensional “momager” villain, is credibly handled into a multi-dimensional one. Mbatha-Raw is a shining star, and this movie is just a twinkle in her rising star; I’ve heard she’s just divine in Belle, which I haven’t seen yet but has been is securely at the top of my list. This is not exactly a great movie, and it does rely on at least one corny montage on the beach that the world could have have done without. But there’s also a gentle exploration of race and gender, so it’s cheesy, but it’s a nice cheese rather than generic. This entry was posted in Jay and tagged female directors, Gugu Mbatha-Raw, Minnie Driver on February 8, 2015 by Jay.